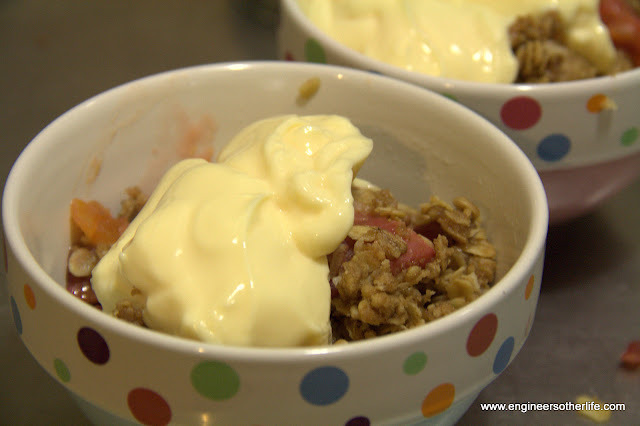 Crumble is such a good standby recipe - if you don't add too much sugar and butter, it can double as a breakfast food too. Leftovers, of course - I don't expect many people bake before breakfast! Because crumble is so awesome, I've blogged about it before. This is approximately the topping recipe that I used tonight. And, um, I still have several of those tins of peaches. Mix it all up in a big bowl until well combined. Put it into the baking dishes of your choice. Bake for about half an hour at 180°C. The custard powder absorbs some of the excess liquid (and of course tastes yum). The ginger just adds a zing - you can do without it if you don't like it! Serve warm with vanilla icecream, cream, or custard. Also tastes good cold. Oooooh, crumble... I should try making crumble sometime soon... YUM YUM YUM!! Well, it's not a high-effort dish, which is good. Maybe it would impress your mum? My family appreciate people cooking for them! Oh I lovvvvvvve crumble. 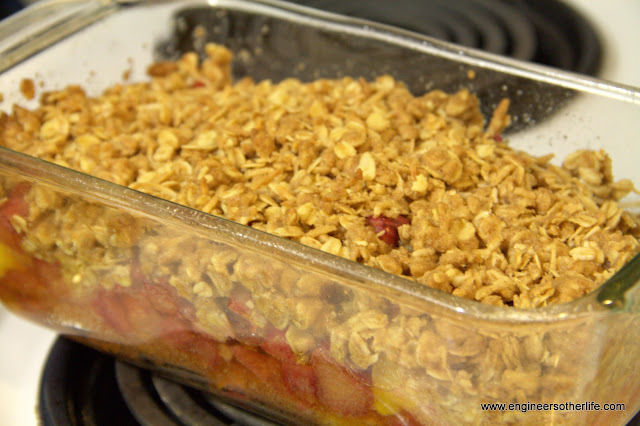 I have a really good crumble topping recipe but it's not very good for you. It's fluffy and crispy all at the same time. Let me know if you want it! You should blog it! Crumble is great. I like this particular topping because it is like a less-chewy Anzac biscuit.